The water is so calm this morning without the trade winds as the sun rises to warm my body. Believe it or not it’s kind of chilly here. Seventy six is a bit low for us. We had a nice squall roll through very early in the morning that cooled things off. As the Sun comes up over the hill some of the sleepy sailors are waking up from their Friday night. One guy from New Hampshire is already swearing out loud as he smacks his leg on the boat trying to go for a swim off the stern. A couple of small wooden fishing boats zoomed past as they head out to sea. You see them out there lazily waving while you’re holding on in six footers and twenty knots praying to make port. It’s all attitude people. Attitude and Dramamine. The radio is starting to crackle with the morning announcments and the water is ready for more tea. 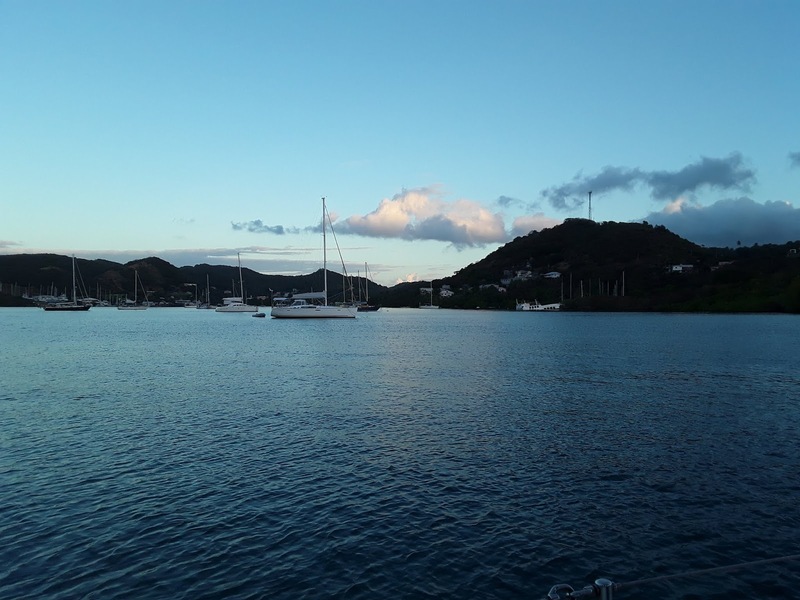 We are on the south end of the island and the trade winds usually whip around this end and filter into the bays. We’re protected from any waves and for most of the swell but the wind tends to find it’s way in except for this morning. I see some boats are feeling a breeze so maybe it’s just us being so close to the eastern side. We are enjoying the unexpected stillness. We hopped on the crowded shopping bus yesterday with the usual characters. We’re the unknowns. People recognize us but don’t know our names. When they hear the boat name they go, “Ah. So you’re Kelly Nicole.” Interesting. I ordered a baguette today from the local French restaurant. Looking forward to some veggie sandwiches and a nice crisp salad. 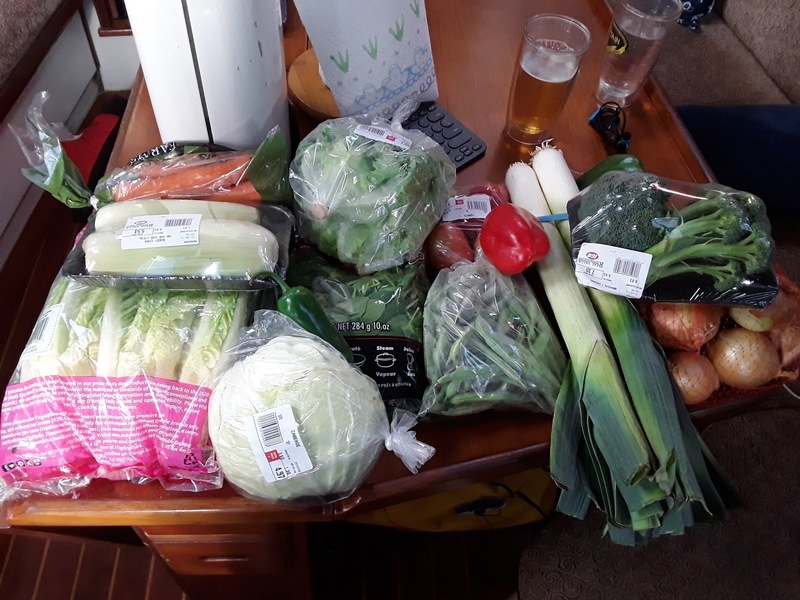 We made a big haul on veggies at the market yesterday and I intend to use them in tasty recipes I found on the internet. Again there were no cucumbers but there were tomatoes. Looks like my Greek salad will have to wait another week or so. We keep hearing cows on land near the shore but we don’t see them. So instead of roosters in the morning we’re hearing cows. It’s a nice change. They’re not up as early as the roosters. We have a few chores to do today to get ready for haul out. As unsettling as this is we’re still appreciative of this life we’re living right now. We could be making gobs of cash sitting in a cubicle for some corporation and spending it all on vehicles, a mortgage and all the other “Stuff” that goes along with work life including the stress but we’re good. I can feel the breeze picking up a bit and the sun is getting higher. The local radio net is ending and people and boats are moving about. Time to get moving. Have a great day everyone! While sitting in the mall waiting for our bus to arrive, a local friend asked me if there was going to be a civil war in the USA. Debra responded, “Americans are too lazy to have a civil war. They would have to put their phones down and turn the TV off.” Our friend was staring at us a moment and then laughed. The political situation at home is a hot topic down here for some. They are completely shocked about people going to food banks after only one month. I would be interested to talk to them a bit more about this. It could be a good blog post but politics is a touchy subject. It’s like discussing the best anchor. People will rage. I think I’ll pass on this one.